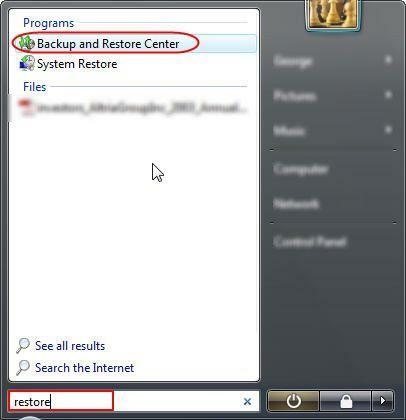 In the search field of the Start Menu type the word 'restore' and then click on the Backup and Restore Center shortcut. Alternatively, you can go to Control Panel -> System and Maintenance -> Backup and Restore Center. 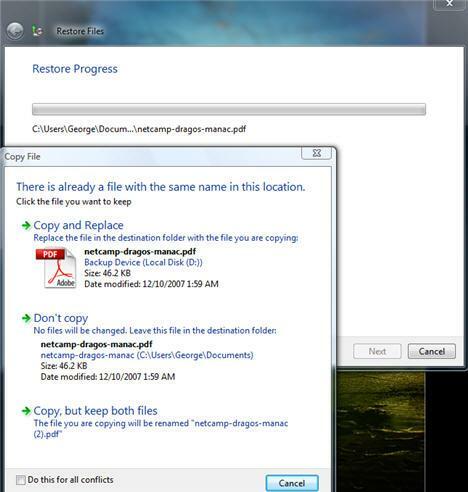 In the Restore files section, you have two options: Restore files and Restore computer. In this tutorial, I will cover the Restore files procedure. 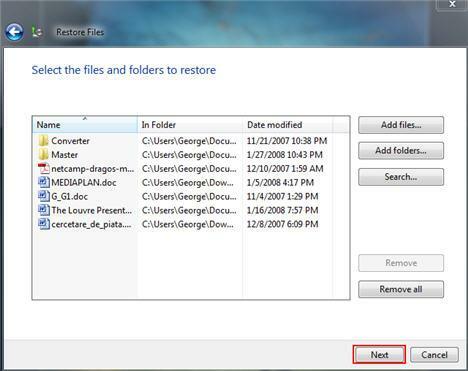 After clicking on the Restore files button, the wizard will ask if you want to restore files from the latest backup or from an older one. Choose the option you prefer and then click Next. Now you have to browse and add the files and folders that you want to restore. First, click on the Add files or Add folders button. 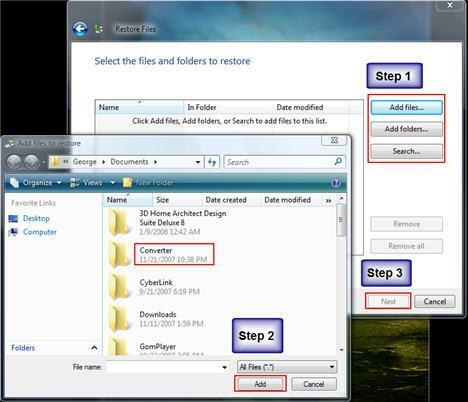 Then, find the files or folders that you want to restore, select them and click on the Add button. 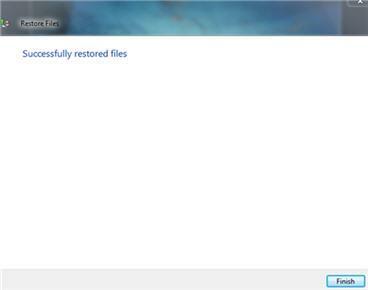 Repeat this procedure until all the files or folders that you want to restore are present in the Restore Files window. Notice: You are allowed to browse only through files and folders that were previously backed-up. If you can't find a specific file or folder click on the Search button. 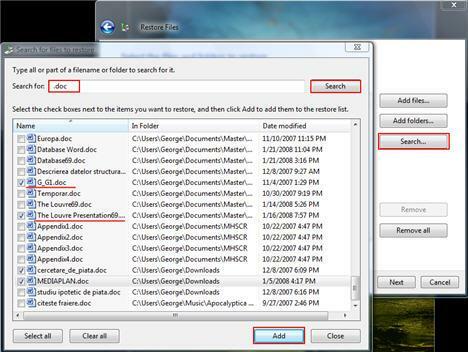 Then, type the name of the folder/file in the search field and click on the Search button. If the folder/file has been found, select it and click on the Add button. Tip: If you don't know the name of the file you are looking for, but you do know what the file type, you can search for all the files that have the same extension (.doc, .mp3, .xls, etc.) as the file you are looking for. For example, type '.doc' in the search box and click on the Search button. After you have finished adding the files or folders that you want to restore, click on the Next button. Now, you will be asked if you want to restore the files in their original location or in a different one. 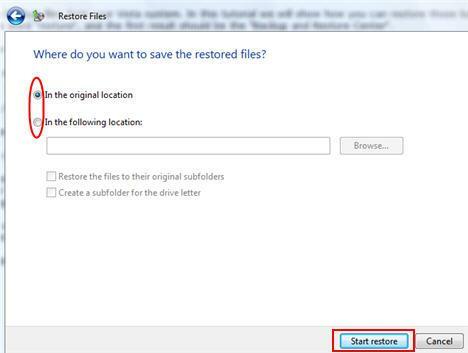 Choose the option you prefer and then click on the Start restore button. Notice: If the same file that you want to restore is found in the same location, you will be notified and you will have to choose one of the following options: 'Copy and Replace', 'Don't copy', 'Copy, but keep both files'. After a while, the restore process will be completed. Once you are notified that the files were restored, click on Finish. How do i restore my files from the CD i backed them up to?? I tried to restore them but i couldn't. how do i do it????? running on a windows 2008 server ? As lots of others, I have used this but now have problems restoring my backups and am witnessing the "A valid backup location could not be found" message. This utliity seems poor at best. It is not very user friendly. I have read that the user needs to put the last DVD in first when restoring from such media which will confuse quite a few. My issue is related to an external HDD and the application provides little info about what the issue is. Backup works fine - restore needs work or a tool! When is a backup most needed? When there has been a disaster of sorts. As in complete os reload. 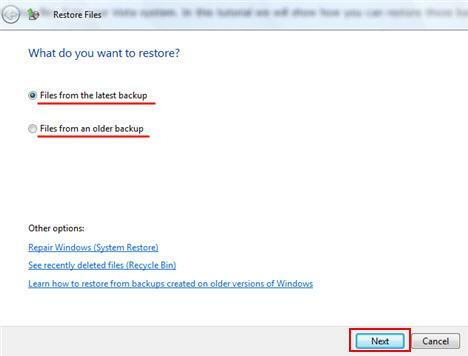 Backups are then unworkable as the original locations may not be available and this stops the entire restore process. Working through the back up zip files is tedious at best, and completely impractical for back up sets running more than a few months. If there is a tool for exploring back up sets please can you promote that on your "information" pages for the back up and restore tool? Im currently using windows vista home basic and cant restore files from a backup that i made on an external hard drive.If i try it sais "There was an unexpected error: the data area passed to a system is too small (8007007A). Backup will now close.Please Help!!!!!!!!!!!! I'm using Vista Home Premium. It wasn't booting up right and so I went ahead and did a backup to my external hard drive of all files. I then did a system recover and reloaded all of the system files. When I went to reload the most recent backup, the wizard was unable to detect the backup on the external drive. It could find several older ones but not the most recent one, which is missing a lot of files and pictures. It does show up if I run Windows Explorer and it shows a file size of 31 Gb, so it's not empty. How do I recover these files? Everytime I try, the Wizard shows me the same older backup files. please do a tutorial in how to restore backup files from hard disk and I am currently using windows 10 Single language (64-bit). thank you.